More than just a reengineered SRX, the Cadillac XT5 rides atop a new chassis that allows it to weigh a total of 126 kg less than the outgoing SRX. 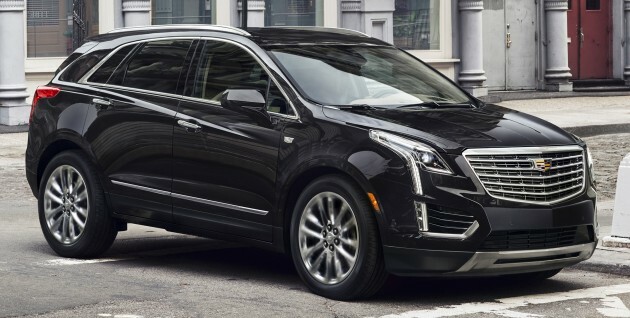 Against offerings from rival manufacturers, the Cadillac XT5 is a whole 295 kg lighter than the Mercedes-Benz GLE-Class – against the Audi Q5, it is lighter by 45 kg. Looks wise, the new XT5 appears to cut a cleaner image whilst maintaining the marque’s trademark design language. In front, there’s a bold grille with horizontal bars and vertically-stacked LED daytime running lights (DRLs) that cut deep down into the lower half of the entire front fascia. Elsewhere, customers can choose from a choice of either 18- or 20-inch wheels. 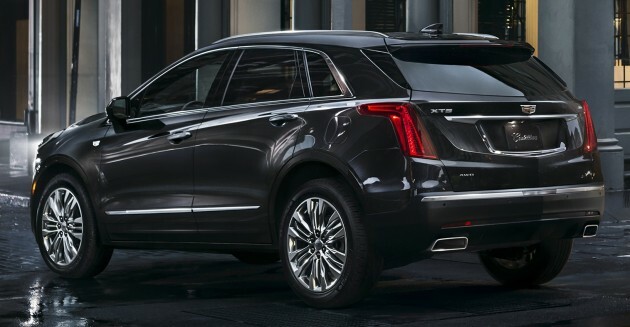 At the rear, the taillights echo the design set by the aforementioned DRLs by edging into the rear haunches of the Cadillac XT5. Down below, a prominent diffuser-like element houses twin, squared-off exhaust outlets. 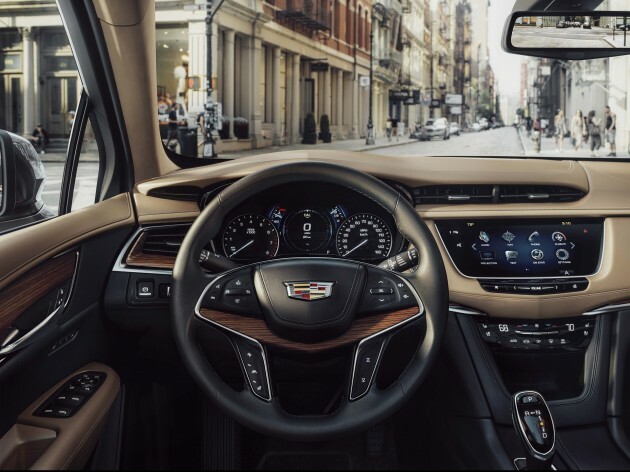 Inside, the Cadillac XT5 follows on from the architecture laid out by the Cadillac CT6. Featuring “cut-and-sewn wrapped panels,” the interior appears to possess plenty of leather-wrapped bits and bobs along with liberal applications of wood panelling – the latter even appears to bridge the main spokes of the leather-wrapped multifunction steering wheel. Thanks to the new base architecture of the XT5, rear legroom has also been improved by 81 mm over the SRX. Other novelties include a new CUE infotainment system with 4G wireless connectivity, an integrated WiFi hotspot and Apple Carplay and Android Auto compatibility. Also, ‘Surround Vision’ that allows for a “bird’s eye” view of the car and colour-configurable head-up display unit is featured – the latter is an optional extra. Also making its debut on the Cadillac XT5 and CT6 is the brand’s new “industry-leading” Rear View Camera system. Said system is said to enhance the driver’s rear vision by 300% via a live video feed displayed on the rearview mirror. A “high-dynamic range camera” streams the feed from the rear of the car to a software that removes obstacles such as the roof and rear pillars. Under the bonnet, the Cadillac XT5 is powered by a 3.6 litre V6 petrol engine with 310 hp and 366 Nm of torque – the Chinese market will receive its XT5 with a turbocharged 2.0 litre four-cylinder mill instead. The sole transmission choice is an eight-speed automatic transmission which is set to debut Cadillac’s Electronic Precision Shift – think along the lines of BMW’s take on the modern gear shifter. All-wheel drive will be offered as a cost option. The new twin-clutch system is capable of transferring up to 100% of the engine’s power to either axles depending on the situation at hand – the rear axle itself features an electronically-controlled rear differential that can shuffle power between the left or right wheel. Safety features include the marque’s Driver Awareness and Driver Assist package that adds on “automatic front and rear braking for low-speed conditions” as well as Lane Keeping Assist, Rear Cross Traffic Alert, Side Blind Zone Alert, full-speed range Adaptive Cruise Control and Automatic Parking Assist. The first-ever 2017 Cadillac XT5 luxury crossover is the cornerstone of a new series of crossovers in the brand’s ongoing expansion. The first-ever XT5 premieres in November 2015 at the Dubai and Los Angeles auto shows and begins production in the U.S. and China in spring 2016. The flat wooden panel on steering wheel looks like its been cut from some kitchen panels. Perfect timing to bring in with zero US tax and tariffs..park beside my Ford Mustang! What a nice looking SUV…too bad we won’t be seeing one here in Bolehland. I’m not a fan of wooden panels inside cars. Instead of having the ‘luxury’ feel, it feels cheap because the woods are usually too shiny, with the exception of Rolls Royce and Bentley. However, I dig this design! It does look pretty good with the wooden panels..and they are not shiny! Coming soon to Malaysia. Terimakasih tppa!! Theres something about cadillac’s compact SUVs (by compact I mean, comparing it to the massive escalade and be called an SUV) that looks, well, compact. The design is bold but looks like it has been crushed front and back which makes it look small and cute…and huggable! Next Post: Brabus Rocket 900 Desert Gold Edition – 1,500 Nm!